Louie is the Student Ministry Director at River Ridge. 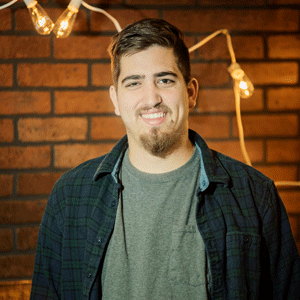 He oversees both Middle School and High School ministries for students in Teays Valley. Louie loves to spend time with students and invest in their lives during possibly their most impressionable time. Louie is from Canton, OH and earned his Bachelors in Youth Ministry from Malone University. He has worked in a variety of jobs during his college days. He was also a Young Life leader in the Canton area. Louie and his wife Dana fell in love with River Ridge and decided to relocate and accept the position. The relocation also created an opportunity for Dana to attend PA school locally. Louie enjoys photography, board games, and playing guitar. He has a moderately unhealthy obsession with video games and all-things Star Wars. He also volunteers time with Young Life in Putnam County.